Good evening dear @honestcash community and my friends this is Raghav singh from India. Friends today I am going to share a very beautiful watercolour portrait of a very beautiful girl and this is the most beautiful portrait I ever made in my life till date, this is a multicolour painting where I used several colours to make this painting and you can assume that on her face you can witness the several colours of the life, Friends I am very happy today as I made something very beautiful and interesting which will blow your mind and I am sure about it. Friends I spends almost couple of hours to give it a very beautiful look and this is the result you can see how beautiful her eyes are. Friends I uploaded the complete making process in YouTube so you can enjoy it there. Dear Friends I hope this multicolour portrait will win your heart and I am sure you will enjoy the complete making process of this beautiful portrait. The beauty of this portrait is definitely soothe the heart and eyes of my fans as this portrait and the portrait of Lord Krishna given me so much recognition in an art gallery recently displayed my artwork in my own city and so many artists applaud my work, this painting and the most beautiful and wonderful painting which is too close to my heart the painting of Lord Krishna wins the heart of entire artist community of my city and it's a very wonderful experience for me. 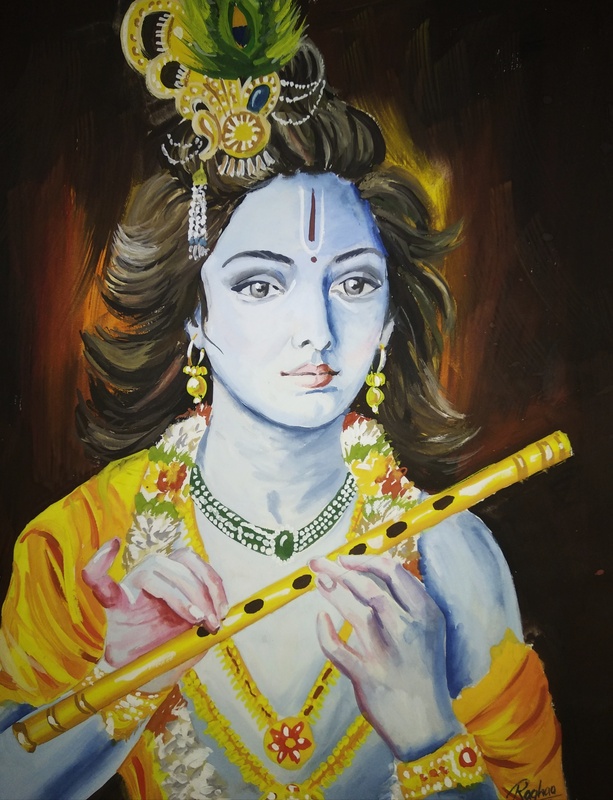 So here I am sharing the both portraits which are very special wonderful beautiful and close to my heart and I am sure you will love these both paintings so friends share your views here on comments. RE: Painting that given me huge recognition among the artist community of my city. Man, your art style is really unique. I especially like the eyes of your portraits and they really make the paintings come to life! keep up the good work.